Augustus was born in 63 B.C., and was the son of a senator, Gaius Octavius and Atia, the niece of Julius Caesar. 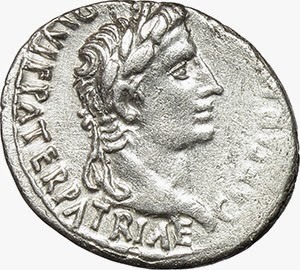 At Julius Caesar's death, it was made known that Octavian was adopted as Caesar's son and made his heir at age 18. With the help of Cicero, he was made a senator. He, along with Marcus Antonius (Marc Antony) and Lepidus formed the Second Triumvirate. In 36 B.C., Lepidus opposed Octavian's authority, but he was defeated, and stripped of his office and forced out of public life, but was allowed to live. Antony allied himself with Cleopatra VII of Egypt against Octavian. Octavian declared war against Cleopatra, for she was not a Roman, and Antony was. The battle of Actium ensued, during which Antony and Cleopatra escaped by ship back to Egypt. They both committed suicide when Octavian invaded Egypt and annexed it to Rome. After further military and political action, Octavian was given the titles Augustus and princeps, and at that point was effectively the first Roman emperor. Octavian's wife, Scribonia bore him a daughter, Julia, who in turn bore her husband, Marcus Agrippa two sons, Gaius and Lucius. Augustus adopted Gaius and Lucius as his own sons, and potential heirs. Lucius died in 2 A.D., and Gaius in 4 A.D., thus creating a path to succession for Augustus' stepson, Tiberius.